PondZilla is an all-natural biochemical catalyst that enhances the breakdown of proteins and complex carbohydrates found in dead aquatic plants. The molecular make up of PondZilla enhances penetration of algaecides/herbicides and bacteria into target sites. 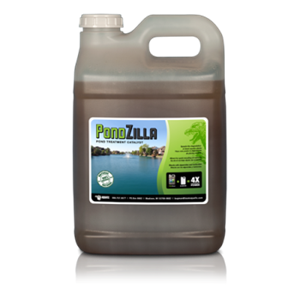 PondZilla is an all-natural biochemical catalyst that enhances the breakdown of proteins and complex carbohydrates found in dead aquatic plants. The molecular make up of PondZilla enhances penetration of algaecides/herbicides and bacteria into target sites. PondZilla is not a surfactant, oil or stripper but it works at the cellular level for better solvency and uptake. Applicators have used it to degrade dead organic matter. Applicators get called out to clean up dead plant material and have to tell the customer, “I cannot kill dead.” Although our products do not kill anything, the molecular make up of PondZilla will boost algaecides so they can penetrate the resting structures while it enables naturally-occurring bacteria to degrade dead organic matter. PondZilla releases specific biostimulants that allow the naturally-occurring bacteria and fungi to take over degradation of the dead flora and fixation of available nutrients. For ponds that receive a lot of leaf matter, this is a good way to break them down. Leaves from soft maple and fast growing trees tend to degrade better than pine needles and leaves that are high in lignin (oak leaves). If leaves are already decomposed PondZilla will help degrade them further. If leaves are fresh PondZilla will complete the degradation over the course of a summer. PondZilla also degrades pollen from pine trees, cottonwoods or others. NOTE: PondZilla DOES NOT kill aquatic plants or algae. PondZilla works over a wide pH range, but for best results use citric acid or a low-pH surfactant to adjust tank mix to a pH of 5 to 6.